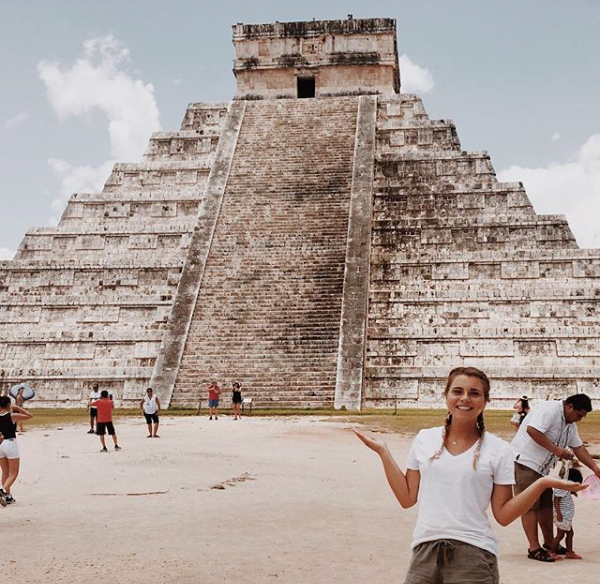 If you’re planning on seeing all of the World Wonders or just want to hang out with some of Mexico’s coolest ruins, a trip out to Chichen Itza is a must. Especially since this is only a day-trip kind of activity, you can spend the rest of your vacation around this part of Mexico …which may or may not be home to some of our favorite gems. Worried you’re missing out on the best of Mexico? This Mexico Destination Guide highlights all of our favorite go-to spots. Vacationing in this part of Mexico is a win-win: not only will you find thick jungles hiding ruins, but you’ll also find some of the country’s prettiest beaches, plus pristine swimming holes hiding in caves. Here’s what you need to know bout planning the ideal itinerary to fit it all in. What’s now a very popular site for tourists is still a pretty important archeological site. It was the epicenter of the Mayan civilization, serving as an important political and cultural center starting from about 600 AD (though some estimate it’s been around for about 400 AD). The city was exceptionally advanced, tapping into the underground rivers that flow beneath the city as a water source, and paving the roads … something that wasn’t happening in Europe at the time. Researches also believe the many of the grey, stone structures you see now were painted vibrant greens, yellows, reds, and blue. 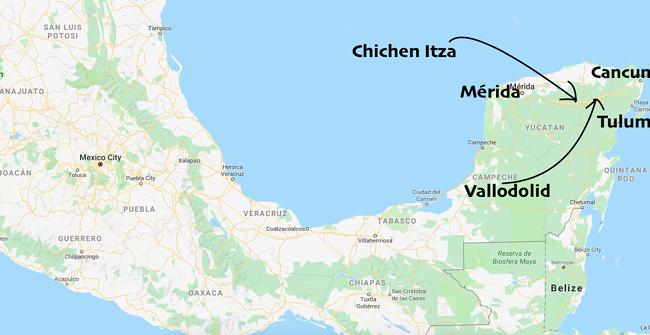 The site started to fall into ruin around the 1200s (researchers think the Mayans moved to a new capital and mostly abandoned Chichen Itza), but there was still a bustling civilization there when the Spanish invaded and took over briefly in 1526. Since the 1800s, it’s been a fascinatingly important archeological site. Sacbe Number One: One of the paved streets of the city that extends nearly 900 feet. El Castillo: Standing close to 100 feet (and sometimes known as the Temple of Kukulkan), this pyramid was named for a Mayan god that appears as a feathered serpent … this is the huge pyramid you’ve all seen pictures of. The North Temple: Also called the Temple of the Bearded Man, this small building is next to the Great Ball Court. Peek the carvings on the inner walls. Temple of the Warriors: Another large, stepped pyramid. El Osario: Another step-pyramid structure with a temple at its peak. Costs: There are two tickets you have to purchase to enter Chichen Itza. You’ll be directed to two windows: one requires a 70 pesos, the other requires a 172 peso fee. All in all, it’s about $13 USD. It’s best to bring cash because sometimes the ATMs and cash machines nearby are out of order. There is also a night time show (tickets are 483 pesos). It’s a total thrill, watching the history projected on the massive pyramid, plus other light features, not to mention the glittering stars overhead if it’s a clear night. It plays every night (in Spanish). Get your night tickets here (must be purchased in advance). You’ll find tons of guided tours to this famous site before you even arrive at Chichen Itza. Just talk to your hostel or hotel if you’d like to arrange that. You can also get a guide once you arrive at the site. There are also tours if you’d like a religious perspective of the site. 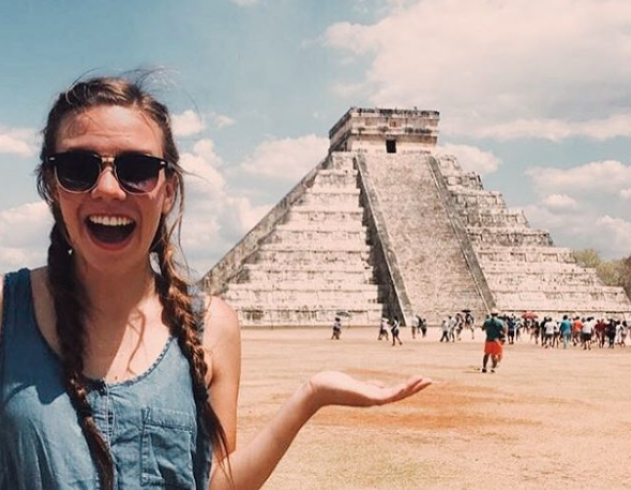 A few companies offer tours that point on connections between Chichen Itza and the surrounding civilization that line up with the beliefs of the Church of Jesus Christ of Latter-day Saints. 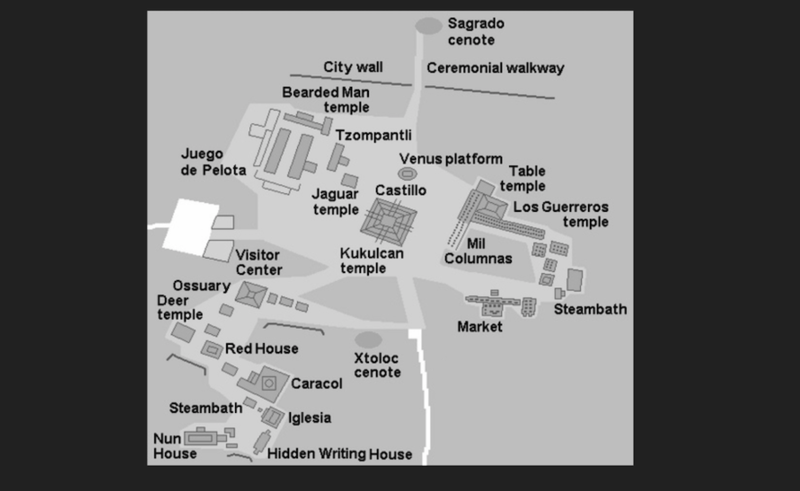 Get information on LDS tours of Chichen Itza here. Avoid the crowds and heat arrive as close to 8:00 AM as you can. Or, plan on visiting for a couple hours at 3:00 — most tourists have left by 3:00 and you can have a bit of break until the site closes at 5:00 PM. Don’t go on a Sunday. It’s free for Mexican citizens, so you’ll see larger crowds on this day of the week. Bring plenty of water, sunscreen, and snacks. Outside of the park, you can find a few snack kiosks to buy snacks and drinks, but there isn’t anything like that inside. It is hot. There is hardly any shade in this complex, and it gets hot. Pack sunscreen, wear light-weight clothes and bring plenty of water. Your itinerary really depends on where you are coming from. Since the ruins are found in the jungles and not on the outskirts of one set town, there are multiple jumping off points to visit this spot. The biggest nearby hubs are Merida and Cancun, though you can take various buses from a handful of locations (we prefer Valladolid). Take A Colectivo. It’s a 12 passenger van you share with other passengers, and they’ll leave when full, or about every 30 minutes from about 7:00 AM to 6:00 PM. Plan on paying 40 pesos for a 1-way ticket. Find the pick up spot on Calle 46 North, just north of Calle 39. It’s a small parking lot behind the ADO bus terminal, according to this blogger. Take ADO. You can also take an ADO bus (just head to the ADO bus terminal, found at the corner of Calle 46 and Calle 39). Prices are 84 pesos for the one-way, first class buses. They leave Valladolid around 10:00 AM and leave Chichen Itza at 4:30 PM, so you’re on a stricter schedule than if you took a collective. Get an up-to-date schedule here. There’s a daily ADO bus that leaves Cancun to Chichen Itza. It typically leaves at 8:45 and arrives a touch before noon which makes sense, since the drive is about 120 miles. Check the dates and prices (and availability) here. 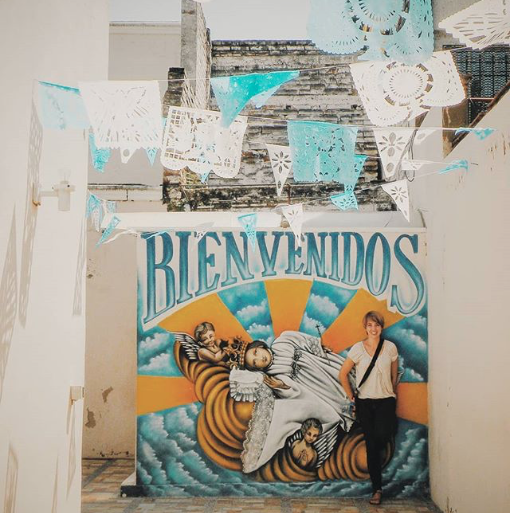 Just seeming to keep in mind with the Cancun bus: You’ll be arriving right in the thick of the crowds, which is why we recommend finding another jumping off point (like Valladolid) if you have room for that in your itinerary. Head’s up: Cancun is in a different time zone from Chichen Itza (and the rest of Mexico), so from October to April you will be an hour ahead of the rest of Mexico if you’re in Cancun. During April to October, you’re in the same time zone. Good to know when you’re booking your tickets and planning your itinerary! Plan on riding for around 1-2 hours to reach Chichen Itza from Merida. Tickets are about 58 pesos. You can take the first class bus (catch these at Terminal CAME Calle 70 / 555 - 71 in Downton Merida. Or Terminal Fiesta Americana Calle 60 on the corner with Calle Colon. These buses tend to leave three times a day: 6:30 AM, 8:30AM , 9:15 AM, but often just leave when the buses are full (got to love life in Mexico). You’ll make several stops along the way which contributes to a longer bus time for the second class buss — they stop at about 10 more places more than the first class bus does, which makes for a longer ride. It’s about a 1.5, 2.5 hour bus ride from Tulum to reach Chichen Itza. Our suggestion is to get a ticket for an ADO bus: you can check the bus schedule and prices online. There are usually two buses, on that departs in the morning (around 9:05 AM and arriving at 10:40 AM ) and an afternoon bus (leaving around 2:45 and arriving at 4:20). We highly recommend taking the earlier bus to help avoid the crowds, plus you’ll have ample time to explore the ruins before retuning back to Tulum if you’re treating Chichen Itza as a day-trip. All ADO buses drop you off and leave from the west entrance of Chichen Itza. You can’t buy tickets for ADO buses without a Mexican credit card, so plan on arriving early to purchase your ticket with cash. You can buy them a day in advance. Be sure to double check all bus schedules, times, prices, addresses, etc. yourself. While accurate when written, details are subject to change without notice. 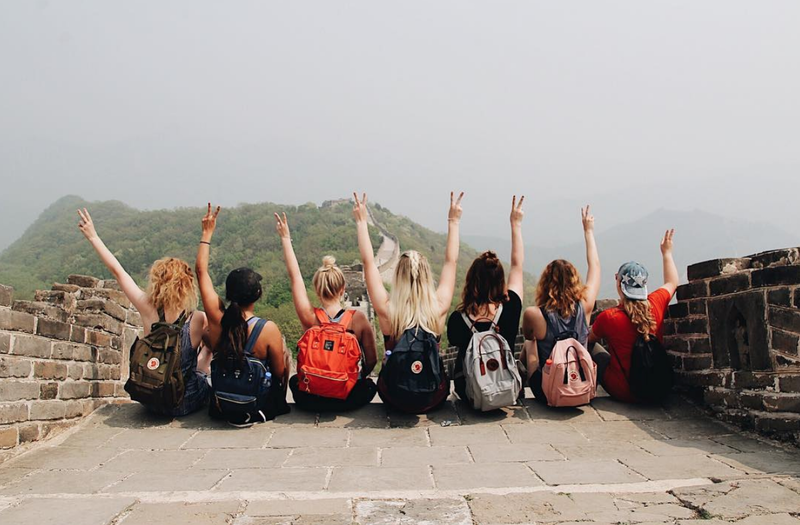 Ready to spend a semester abroad in Mexico? There's way more to see in this country than what you could explore in a week or two? Come call Mexico home while you volunteer here! You'll be teaching English part time (no experience necessary) and will have free time, every weekend off, and vacation time to see even more.